I spent the summer getting in condition for a hike across the Grand Canyon — down from the north rim and out to the south rim. 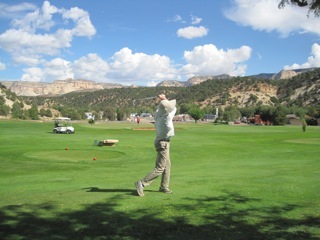 I made this same hike three years ago, and tried to play golf as well while getting in shape. The problem was, that the conditioning hikes made my legs too tired to play good golf, and playing golf didn’t let me rest between conditioning hikes. So golf went out this year. My wife and I made the hike last week, and it’s now time to start playing again. I spent most of September at the driving range getting my swing back in shape, and also re-learning how to chip and putt. I was also having real trouble getting my driver off the ground, which is when I hauled out my old 2-wood and began getting the air that I was missing. I have always thought that if you can hit the ball straight and you can putt, then you can score. So that’s what I’m working on mostly at the range. We have about one month of good weather for golf left in western Oregon, and I intend to take good advantage of it. I was still hitting slap hooks, though, a problem that has plagued me for years. I finally found a solution, I think, by noticing that when I stopped at impact, my right elbow was sticking out. Sure enough this closes the clubface dramatically. Johnny Miller has a video called Johnny Miller’s Fixing Your Swing Golf Clinic, in which each section is about how to fix a particular ball flight flaw. Whenever something goes wrong, I watch this video and the solution is right there. In the hook section, he pointed out that if your right elbow comes out, you’ll close the clubface and hit those slappy hooks. That’s good enough confirmation for me. 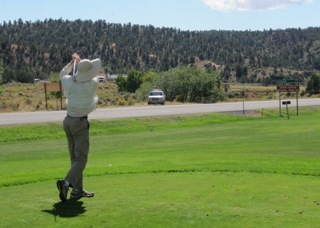 So I’m working on keeping my right elbow tucked against my right side as the club comes into the ball. This is new, and as with everything new, it’s hard to practice a new thing without either overdoing it or forgetting everything else that I’m doing right. 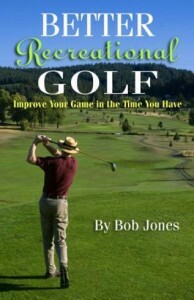 You might think that by not playing golf that this was a lost year golfing-wise for me, but remember that in May I got started learning how to release the club through the ball, and now I have figured out about the right elbow. This could end up as my best year yet. 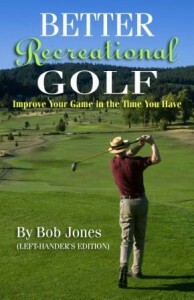 So much is said about the mental game these days, but I have read all the books and none of them get to the real point. The real point is to calm your mind and not let outside influences disturb it. That’s it. It is the only mental skill you need. If you can do that, everything else is an application of that simple principle. Remember the time when you were looking into the green with a 7-iron in your hand and you knew, just knew, that the shot would be sweet and the ball would land close to the hole, and it did? You didn’t think about swing technique, or what could go wrong, or what you wanted to happen, you just hit the shot. Nothing else. That is what I mean by having a calm mind. There are techniques that teach you to calm your mind at will, but they require personal instruction and steady practice on your part over time. This is not something easily gained. By knowing what a calm mind is, though, and you do, you can practice attaining it in every phase of your life so that whenever you need it, on the golf course, or on the job, at home, conducting personal business, it’s there for you. 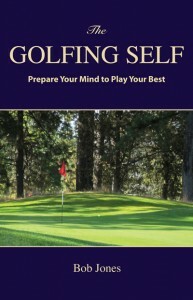 But this blog is about golf, so let me give you a few ways you can apply the calm mind on the course. First, look at the shot you have to hit. Unless you face a shot with forced carry over a hazard of some kind, you can hit the ball any place you choose, right or left, short or long, or dead center. It’s your choice. You’ve played long enough to know that some choices are better than others. Looking at the shot with a calm mind will help you pick the right one — the one with the greatest chance of success in taking the next step in getting the ball in the hole as quickly as you can. Second, you have to hit the shot without thinking of all the things I mentioned before. Take a practice swing, but let’s call it a rehearsal swing instead. Then step up to the ball and concentrate only on repeating the feeling of what that rehearsal was like. Nothing else. Just repeat what you did a few seconds ago. When you’re at the practice range, work on this with every shot you hit. Third, after you hit the shot and see where it ended up, let it go. Forget about the result, good or bad. Do not judge it, especially a shot that was less than you were hoping for. Put your mind immediately on the next shot. There’s a time to get upset by your bad shots and to congratulate yourself on your good ones, but that time is not when you’re out there playing. The mental game is simple, because there isn’t much to it. It’s hard, because you can easily be pulled away from the right frame of mind. Work on getting the feeling of a calm mind at will, and it can be done. It is worth at least four strokes, and I mean it.